As with any Toyota vehicle, when the 4Runner's ignition key is in the key cylinder with the key in the off or accessory position, and the driver side door is open, the key reminder buzzer will sound. This can get quite annoying when you are in and around the vehicle and want to run the stereo, program the Nav, clean the interior, perform a mod, etc. and just simply want to leave the key in the cylinder. This modification disables the key in ignition warning chime. 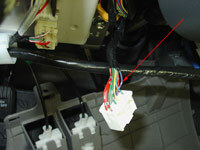 This is a quick and simple mod that requires the cutting of only one wire to complete the mod. 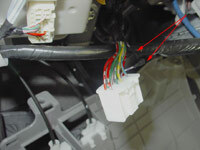 The wire we need to cut is attached to pin # 15 of the B6 connector mounted on the upper left side of the driver side interior relay/junction box. It is violet in color with a green stripe. Disconnect the B6 connector mounted on the upper left side of the relay/junction box. 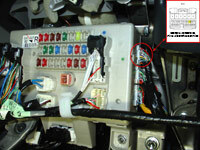 Remove the electrical tape connecting B6 to connectors B5 and B4 which are directly below B6. 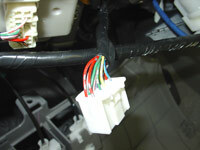 Then remove some more of the electrical tape on the B6 connector to expose the wires. 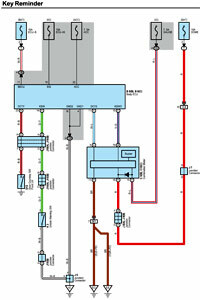 Look for the violet with green stripe wire which is connected to Pin 15. Cut it in half, and tape up the exposed ends. Put some tape back where you removed it earlier, and reconnect B6 to the Body ECU. Put everything back together. Now with the key in the ignition and the door open test that the buzzer no longer chimes.